In 2456 they awoke. Whilst I had always known of their palpable hatred for humankind, I had never known the true wrath of the Bruggan Zealots, nor faced them in battle. For two hundred and fifty years they had watched, seething at us with every opportunity. Now, roused from their slumber for reasons that we would never know, this ancient and malevolent evil came to erase us from the galaxy. This, for fifteen nail-biting hours, was my first game of Stellaris: Console Edition. The Bruggan’s saw my human empire less as a threat than an inconvenience, even though I had spread to populate almost half the galaxy. When their fleets encroached upon our vast empire, they swept aside our whole armada, crushing the our most technologically advanced weaponry and all hope of resistance. As planet after planet fell to the invasion forces of our terrifying foe, human researchers made feverish breakthroughs in weapons, propulsion and armour systems. As the first battleship left its dock in Alpha Centauri — almost twice the strength of the model it replaced — a sense of hope began to prevail. Shipyards in all neighbouring systems began to replicate the design and a truly vast fleet gathered in orbit around Earth, where we knew we must not fall. After years of occupation and rearmament, we flew, not to where the Bruggan fleet lay in wait, but to their homeworld. Before they could respond, their outlying mining stations were destroyed and their infrastructure crippled. When the inevitable battle came, it seemed to last for an eternity. Wave after wave of Bruggan ships arrived at alarming speed, thanks to their mysterious wormhole technology. The blackness of space was pierced by red, blue and green laser fire, whilst nuclear warheads flew in their hundreds from one fleet to the other. The devastation was terrible, with both fleets suffering appalling losses. The humans won the day however, but even as the surviving crews began to celebrate, so came a second Bruggan fleet to eradicate them entirely. 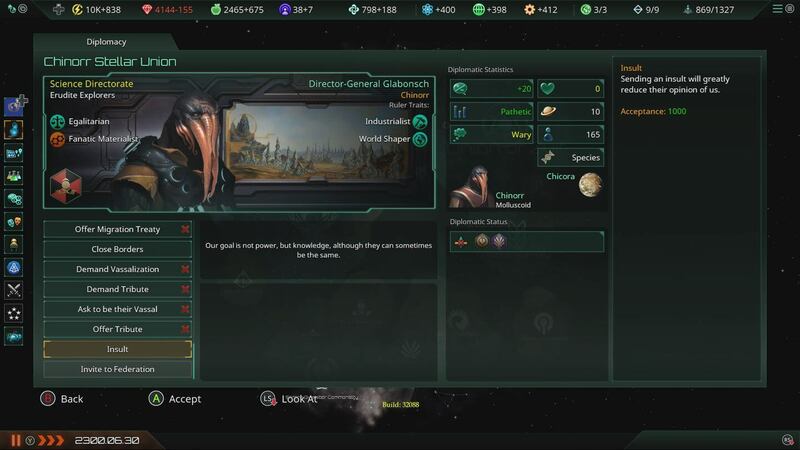 Unbelievable as it may seem, the awakening of the Bruggan Zealots was not the only “endgame scenario” to feature in my first proper playthrough of Stellaris: Console Edition. The second was much more devastating and it came in the form of an alien scourge that arrived from off the map, much like the Golden Horde in a Total War game. This invasive, parasitic species actually forced the peace between human and Bruggan, such was the threat it posed. Even though I was now materially more powerful than I had been at the beginning of the Bruggan war, with an empire even larger than it had been, my human empire failed miserably to defend itself against this new threat. We were swept from the map within a mere twenty years, but, and this is important, the Bruggan’s were made extinct within ten — despite even my best efforts to save them. This, again, is Stellaris: Console Edition. When you enter into a relationship with a video game, you agree to certain conditions. Firstly, when you know what you’re getting into, you have certain expectations. You might expect tight controls and exceptional innovation from a Mario title, whilst you’re certain to want Forza Motorsport to make you feel like a racing driver, even as it holds your hand around the racing line that Turn10 kindly paint onto each course. Stellaris is a game that is better served cold, without expectation and with as little introduction as possible. Essentially an interstellar, science fiction version of Civilization, Stellaris is strategy on the grandest, most incredible scale. A game spans around five hundred years that play out month by month, each game takes about fifteen to twenty hours when played at full, in-game speed, but you simply cannot see everything in a single playthrough, or perhaps even ten playthroughs. Personally, I’ve experienced three, each with a different race, a different level of difficulty and a completely unexpected set of variables, alien races and new things to discover. It is, in fact, discovery, which makes Stellaris so incredible, until eventually it doesn’t. Sure, from one game to the next, the randomised alien races, the planets, the set up and some of the events will vary wildly, but eventually you’ll see enough combinations of these things that you’ll know what to expect. But even as these sweeping differences begin to normalise, your playstyle will continue to evolve. 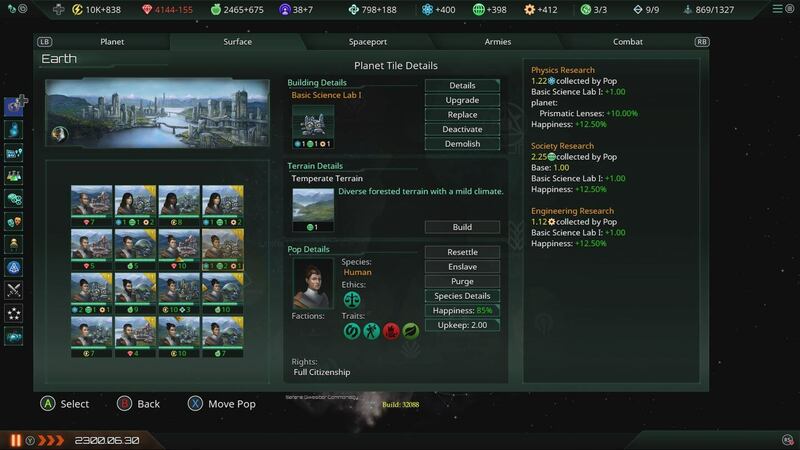 You’ll learn how to make widespread optimisations in production, construction and research early, but finding the extra few percent here and there are what will allow you to survive the various endgame threats that are baked into Stellaris’ campaign mode. 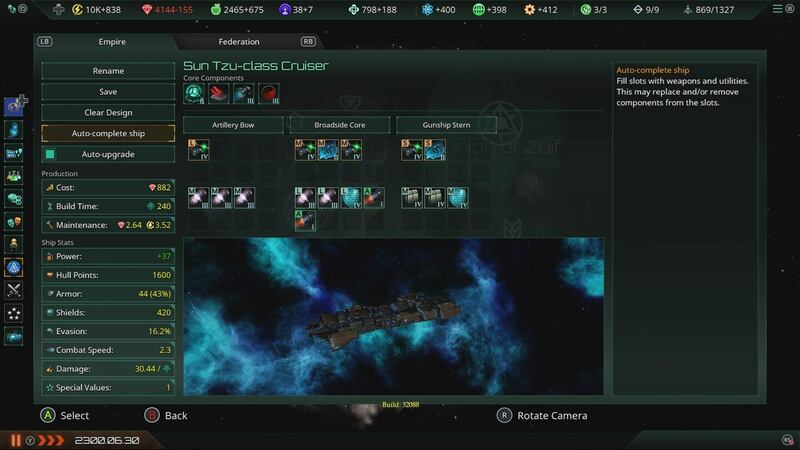 As you make the attempt to do so, it doesn’t help that Stellaris: Console Edition forces players to use the ironman mode in order to unlock achievements. As I did so, I found myself obtaining rare after rare achievement. This was not, I think, due to my skill, but more because few others were playing Stellaris the way it was intended. Forcing console players to experience strategy on this scale via a single save game that only records progress on a fixed, periodic basis is a heck of a stretch, but for me, at least I guess it worked. Much of what you’ll do in Stellaris has a simple, mind-numbing repetition. You’ll scan systems (automated surveys come quite a bit later,) set workers and construct buildings. You’ll construct mining and research stations on distant moons and in the orbit of an unusual star. Setting research or choosing a new ideology will provide a moment of excitement as a less binary choice must be made, but it’s relatively simple stuff. All of this is achieved via gamepad with surprising ease. The D-Pad allows the player to switch between menus on all four sides of the screen. These show resource summaries, alerts about the gameworld, a series of detailed menus and then a shortcut bar called The Outlier, which you’ll come to rely on as you become more familiar with the game. The triggers and both sticks allow the player to pan and zoom with surprising freedom, whilst a click of the right stick switches between solar system and galactic map views. There are some challenges, but smart use of the Y button (on Xbox One) will allow a pause whenever things get hectic, and whilst the action is on hold, Stellaris still allows for orders to be queued and for other activities to be performed. In any case, it’s rare that the action is so hectic that you’ll need to pause — not a lot happens at breakneck speak in Stellaris, so it’s only really during battle that you might want to stop and think. 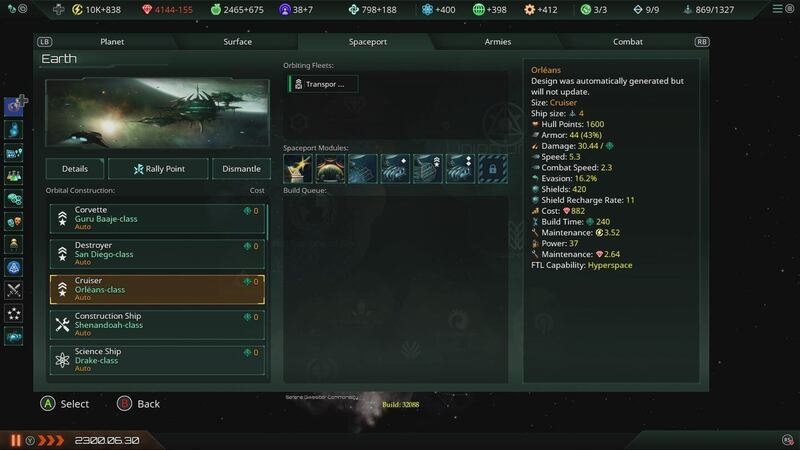 Outside combat, features like diplomacy feel incredibly feature rich in Stellaris, when compared to similar games, especially on console. The range of races and the unique, randomised features that drive them feel both thematic and important to managing the galactic balance of power. Militaristic powers can be antagonistic and deceitful, or threatening but loyal. Other races favour the creation of federations or trade alliances, albeit often on terms that favour their interests. No other game, that I am aware of, offers grand strategy on this scale on console. The nearest that I can think of was probably Civilization Revolution almost ten years ago, but it is both shallower and less broad in its scope than Stellaris: Console Edition, making it a poor alternative. 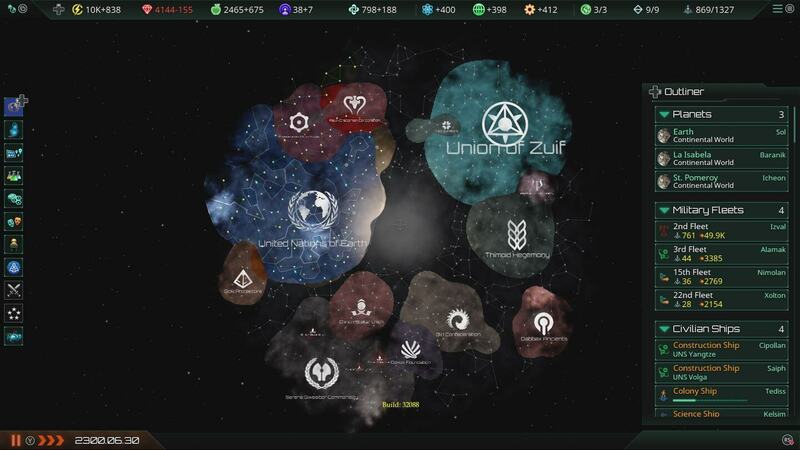 Stellaris lacks the cartoonish visuals and much of the accessibility of everyone’s favourite Civ-lite, but my word does it make up for it with the depth of its ambition. PC players will tell you that Stellaris on console is based on an older, flawed version of the PC game, but I’m not sure I care about that. In fact, I know I don’t care about that. 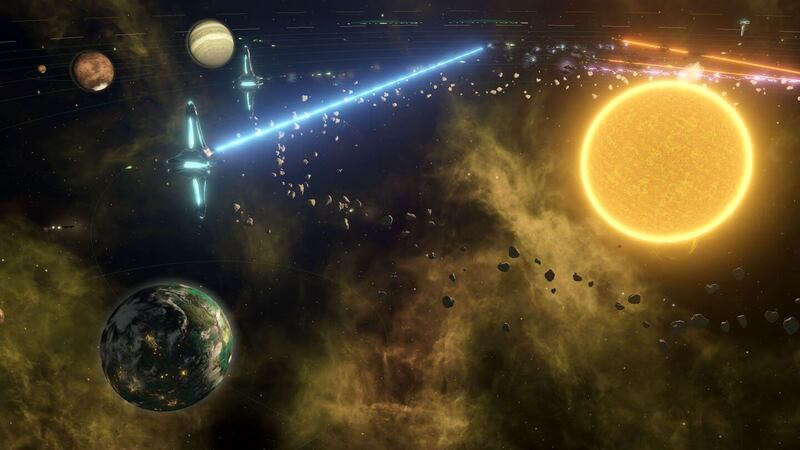 Stellaris: Console Edition is the most ambitious grand strategy game ever to grace a console. It’s probably the most ambitious strategy game of any kind to make it onto the big TV in your lounge. Even so, its complexity means that it won’t be for everyone, but if you do persevere with it, Stellaris is a game that tells stories. Real, relatable stories that will excite, upset and shock you in equal measure. Entire races will rise and fall, planets will flourish and flounder and all of this is in your hands. You can uplift primitive races and take them to the stars, or you can conquer the neighbouring race of peaceful traders and enslave them to do your will. The freedom of choice that Stellaris offers is incredible and occasionally overwhelming, but always enticing. This is a game that demands another five minutes but the next thing you know, it’s three in the morning on a Sunday night. Stellaris is every bit as incredible as it is challenging. It is, without doubt, a masterpiece. On console it’s achievements are even more impressive, since aside from being an aged version of the PC original, it lacks absolutely none of the features that have positioned it as one of the go to grand strategy games in the last five years. Stellaris: Console Edition is available now for PS4 and Xbox One.